5 Beds 3 / 0 / 1 Baths 3,754 Sq. ft. Description: Huge lot with backyard access .25 acre premium lot. 5/6 bedrooms plus a loft, 3.5 baths, 3-car garage. 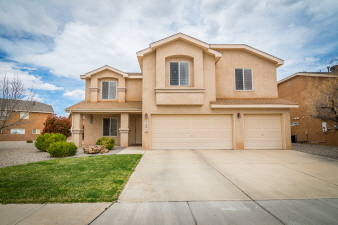 Beautiful well maintained home with lots of natural light. Gourmet kitchen has plenty of cabinetry , an island with electricity and a huge pantry. Beautiful corian counter tops, open floor plan great for entertaining. Tile floors in all wet areas. Wood blinds throughout. Outdoor kitchen/grill has electric outlet, lights, refrigerator and storage drawers. Table has optional propane heater. 6th bedroom or office downstairs. Immaculate and well kept. Easy access to i-25 and minutes to albuquerque. Conveniently located near restaurants, good schools, shopping, theater and the new facebook complex.